Tow Mater is a devoted friend, supportive fan, and influential hat aficionado. See his five best hats from the Cars universe. The Racing Sports Network is your one-stop shop for highlights from the world of Cars. Visit Disney.com/RSN to discover more about your favorite characters, countdown the best racing moments, and replay memorable adventures from the world of Disney/Pixar's Cars. Come back to Disney.com/RSN weekly for your chance to win a different Cars prize! From Radiator Springs to racetracks around the world, Disney•Pixar’s Cars has taken audiences on high-octane, high-speed adventures since the first film debuted in 2006. Race champ Lightning McQueen and his buddy Mater, along with Cruz, Jackson Storm, Smokey, Guido, Luigi, and the rest of the crew, have taken fans along for the ride of a lifetime—and the journey continues! 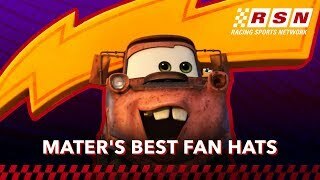 Get your fill of Cars on YouTube.com/Disney.